Your logo and branding is one of the most important aspects of your company – it is what defines your vision and company values and helps you stand out against competitors – especially if you are in a highly competitive industry, you can position yourself as the better company simply by taking more care and attention to your branding, this is the reason large multi-national companies spend so much money on design – it really works. If you are starting out or thinking about a re-brand, then you should spend some time looking at what your competitors are doing and also delving into different niches to get a feel for what works and what doesn’t. You should also spend some time thinking about what message you want to put across to your customers – the research stage is the most important as it can have such a big impact on the future of your firm. If you want to create a unique logo for your branding and you don’t have time or money to hire someone to do this task for you, then we would recommend you to download a logo or branding template and create your own branding identity in just a few minutes. Here, you will find lots of shapes, textures and varieties of designs and from there you have to choose the best one for you. Take a look below, where we have listed over 50+ best logo templates and logo creator packs at our collection. Lady boss logo pack has 258+ pre ready feminine logo pack. They are simple and easy to customize. Besides, These templates will help you to create a stylish brand identity for your business. You must need Photoshop or Illustrator to use this template. It is modern vintage logo template. Here you will find 80+ vintage logos and a bonus font collection. 920 Logos mega bundle is a big collection according to your needs. Here you will find vintage and retro, minimal, feminine edition, monograms, vintage labels, corporate logos, branding ideas for every type of business, hipster badges and lots more. It is a collection of premium logo templates. Her contains 60+ feminine branding logos. Photoshop & Illustrator is a must to use this template. The Girlpreneurs logo pack includes 175+ easily editable modern and minimal logo templates. They are pre ready, so you need to add your own text and you are good to go. This bundle pack can generate thousands of different variations of logos and textures. Besides, it contains 27+ handcrafted textures that are designed for logo templates. Feminine Logo Templates includes 30 Ready Made Vector Logos. you can customize according to your needs and create some eye catching designs. This bundle consists of 900+ elements and the 100+ suggested fonts. This bundle is well documented and contains the necessary files. This vintage logo bundle is one of the best collection so far! This bundle includes a mix of vintage logos, badges, labels, crests etc. If you are looking for an elegant logo, badge or a simple typography logo then you should definitely go for it! This template can be used in Adobe Illustrator only. After the editing is done you can export it to psd format for further editing. Hand Drawn logo design template includes of 800+ elements. It cotains elements like illustrations, patterns etc. Adobe Photoshop or Illustrator is a must to use this template. This amazing logo design templates will help you in your next branding projects. You can create labels, apparel design, typography pieces and more. 400 Minimal logo bundle is the perfect choice for your next project! You can use it for commercial or personal purpose. It can be used in Business card, merchandise, poster, T-Shirt, mug, paperbag and etc. 365 Minimal logo bundle is to give your clients an idea about your portfolio. You can create logos for any fields. It is a minimal, clean and simple logo design bundle. You need Photoshop or Illustrator while using this template. Logo set 6 includes Twenty logo templates. It is saved individually in psd and ai files. This bundle is customizable and vector based. Adobe Photoshop or Adobe Illustrator is a must to work with these files. This bundle is well documented and contains all the files. This bundle includes 60+ vintage logo templates that is the best choice for your next branding projects. Each logo of the template have been carefully created. This bundle has 240 square shaped decorative vector elements and 60 name based text combinations. You just need to choose your favorite ones, mix them up and create your own design. Linecraft Boutique Logo Bundle has introduced a brand new set of High-quality Logo templates. It is an amazing budle and recommened to use in your next project. This bundle contain a well balanced, aesthetic and beautiful design. Hipstar Logo pack contains 18+ unique crafted vintage logos. It is very easy to use and customize. 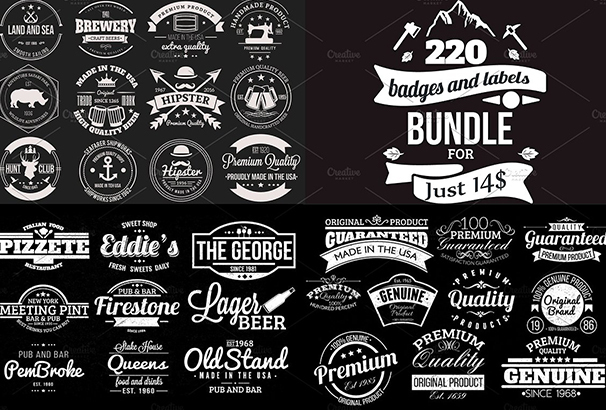 This pack is perfect for creating logos, labels, badges, apparel, typography, and lots more. This bundle pack helps you to design Logos with emblem style. You can create logos for beer labels, restaurants, coffee shops and bars. Besides, you can use it for your Website, Business, Stickers, T-shirt, Retro Labels etc. Geometric Logo Bundle contains 200+ eye catching emblems and 100+ ready made logos. It is created for beginner and expert designers. A list of fonts has been suggested to make it easy for the users to design their brand new logo in a couple of minutes. This pack is 100% free for commercial and non commercial use. Medical Logo Template is the best choice for clinic, hospital, mobile app or any other business. Feminine logo creator kit includes 120 Vector elegant circles and 48 typographic logos. It has 5700+ different logo variations.What you need to do is to choose your favorite designs, mix them up and make an eye catching looking logo. Vintage logo templates bundle includes 42 vintage logo templates and it is the best choice for your next branding projects. Each logos have been created very carefully and they are well documented in this package. 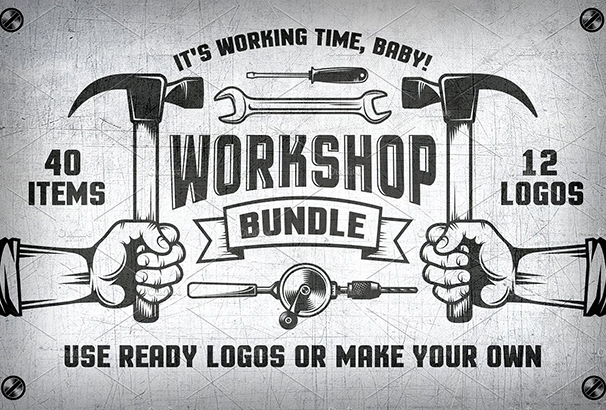 Amazing workshop bundle perfect for placing the designs on any background. You can use pre-ready logos, customize it and make your own design. You can create labels, typography and more with this 33 vector logo templates. If you are looking for a elegant logo or a simple typography logo for business then this is the one and only bundle you are searching for. It is one of the most royal luxury ornaments template for logo, monogram, crest and emblems. You can create elegant business signs, logos, identity, labels, badges, stamps and lots more for your next business project. Logotypes for: Restaurant, Royalty, Boutique, Cafe, Hotel, Heraldic, Jewelry, Fashion, Winery and other. This package includes 17 vintage circus labels, emblems and logos. These elements are well documented and ready to use for you next amazing branding projects. The Photography Logo Kit and Icon Set introduces an amazing collection of 14 logos and 35 icons. Logos and icons in this bundle are professionally designed to provide professional branding to your photography business. In this package both the Photoshop and Illustrator files use vector elements. This is a set of 45 Beer brewery Retro Vintage Logotypes and Badges. You can use this elements for your business signs, logos, identity, labels and other design projects. It reflects the modern 2015 logo style. These typography logos are very tight, narrow, oldish, and a flaming logo. You will find around 50 different variations in this bundle that you can mix and create a new logo of your own. You can use this bundle pack for branding projects. You can create labels, badges, apparel design, websites, stamps, stickers, t-shirts, typography pieces etc. Here, you will find free fonts as a bonus. In this bundle you will find 50 Adobe Illustrator Files, 50 Adobe Photoshop Files, and 50 EPS files. These files are organized and layerd. You can edit and customized each and every files as you need. Bicycles logo collection bundle pack have 8 highly customizable logo templates. It provides you some unique and great logo templates and vectors which are ready to use and are perfect for your next design projects. It has 32 unique vintage logo templates. They are very carefully crafted. In this bundle all the texts and elements are editable. You can use it for logos, labels, badges, apparel, stamps, stickers, packaging and so on. This bundle is a great way of rebranding your company. It will help you to create a fresh and professional new logo design. These bundle is not only limited to photography you can use it for any kind of business you like. It is a beautiful and luxury gold logo design. It can be used for all your web and print designs. However, it will look great on all your business branding such as business cards, your website or portfolio. Besides, you can use it as a watermark in your photo’s. 30 Signature Logos Bundle is an amazing high quality template. It will help you to make creative and professional signature logos. Each and Every signature logo is 100% editable and easy to customize. This is a set winter logos. Besides, you will find emblems, badges, patterns and design elements in this package. This bundle will help you for logo design, shop sign, winter sales and your other design projects. It has 280 original design elements, 48 ready made logos, 36 typographic logo ideas, 44 Backgrounds and Photoshop Styles, and lots more. In this budle, you will get everything you need to make gorgeous customized logos. Coffee Retro is Easy to modify, edit and re-size without the loss of quality or resolution. It is 100% vector shapes editable in Illustrator.